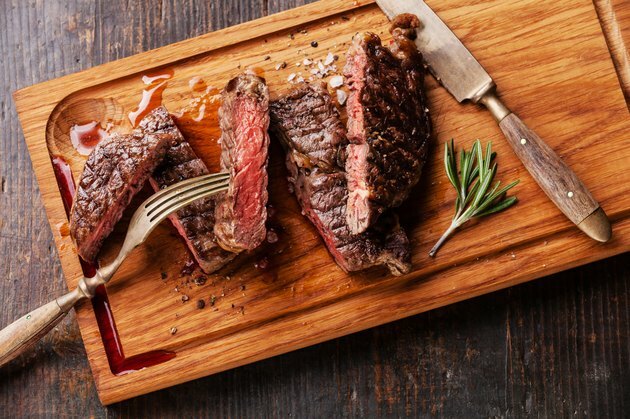 Nausea from eating meat might be a reaction to bacteria in the meat, or it might be something in your body rejecting the meat. For example, pregnant women often find that eating too much meat makes them nauseous. If you feel nauseous between 4 and 36 hours after eating meat, then you may have some form of food poisoning. If you start to experience cramps or serious nausea, visit a doctor as soon as possible. Food poisoning from meat usually happens when the meat contains harmful bacteria. Unrefrigerated, old or poorly cooked meat is more likely to contain bacteria, including harmful strains such as C. botulinum or E. Coli. Nausea is a common symptoms in most forms of food poisoning, though the degree of nausea might vary. Other symptoms may also accompany your nausea, some of them potentially serious. In the case of eating a "bad" piece of old meat with no dangerous bacteria, you may still feel nauseous. The USDA recommends cooking meat to certain temperatures to make sure that you kill any harmful bacteria present in the meat. For example, when cooking pieces of pork, lamb and beef, including steaks, aim for a temperature of at least 145 degrees F in the center of the meat. Ground meat often contains bacteria, so cook to 160 degrees F. Cooking to these levels may help prevent future instances of nausea after eating meat. In a 2001 report published in the "Rivista di Biologia" journal, Daniel M.T. Fessler suggests a link between pregnancy in the luteal phase and nausea when eating meat. Fessler claims that pregnant women develop sensitivities to foodstuffs that might contain pathogens that could harm the baby. Meat is one of the most likely sources of food poisoning. So, during pregnancy the body is more likely to trigger nausea at the sight, smell or taste of meat. Nausea from eating meat might occur for other reasons. For example, a high fat and protein meal puts some pressure on your digestive system. Nausea may just be your body reacting to the volume of meat. In other cases, particularly with people who used to be vegetarians, the body isn't used to meat, making you feel ill when you eat some. Finally, you may be allergic to a particular sauce or ingredient used to cook the meat.